PT Waskita Karya Realty (WKR) is expanding its property business in Denpasar, Bali, by developing a 12-hectare residential area that integrates lifestyle needs and commercial centers. the development situation of residential areas that is growing rapidly in Indonesia, not only requires strong products but also fast in the application process. Asian Infrastructure Investment Bank (AIIB) meets President Joko Widodo to offer loans with a ceiling of US $ 1 billion for infrastructure projects in Indonesia. 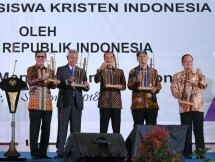 Industry Minister Airlangga Hartarto revealed that the 2018 Asian Games event had brought Indonesia as a country in the spotlight in the eyes of the world community, especially Asia.